I had the amazing opportunity to be a TEDx speaker at Bow Valley College in Calgary, Alberta. The theme of the 2018 TEDx event was ‘Lagom’, the popular Swedish term for balance and living simply. My talk was on the topic of language and identity based on my experience as a blogger, mother and bilingual Pakistani-Canadian. Like millions around the world, I have enjoyed TED talks for many years and appreciate the fact that they are concise, sharp and educational. After going through the process myself, I developed deep respect for all the steps and effort that go behind a successful event. Tahira Ebrahim from the School of Global Access at Bow Valley College was my main contact and support person. 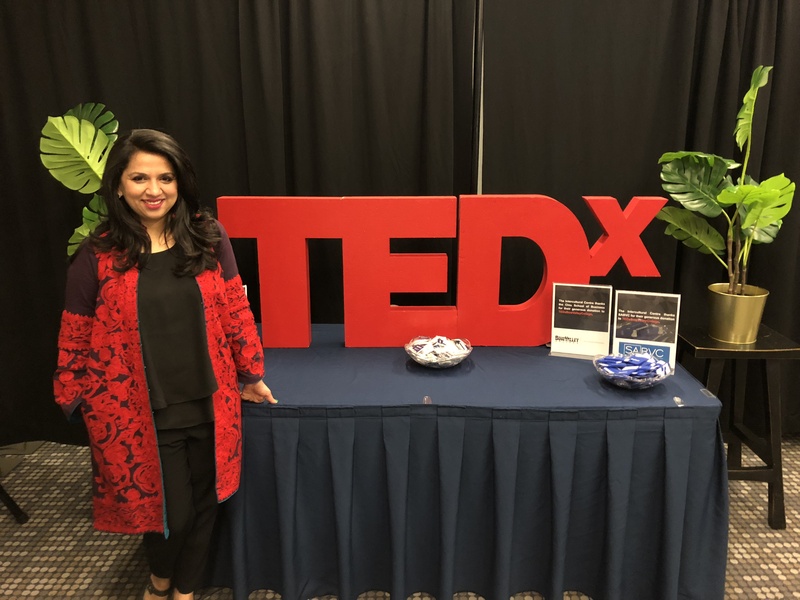 I had done a lunch talk on the importance of maintaining home languages for the students and instructors of Bow Valley College a year earlier in September 2017 and was approached for a possible TEDx talk at the college. I was beyond excited and immediately said yes! We started brainstorming about the big idea six months before the event. Over the months, I worked with Tahira, as we defined the talk, worked on the stories and thought about each and every word we included. I was happy to include my experience of growing up in Pakistan, moving to Canada, raising bilingual (English/Urdu) children and passing on the love of Urdu and culture through my blog. There were many rehearsals but still I felt nervous on the day of the event. My husband and friends had showed up to support and there were many whose prayers I had with me. As my name was called and I walked to the front of the room to deliver the talk, I reminded myself that I was lucky to have this platform. I love talking about language and identity and this was an amazing opportunity! I truly enjoyed delivering the TEDx talk on language and identity. I hope you enjoy my talk! Do remember to pass on the gift of multilingualism to your children!